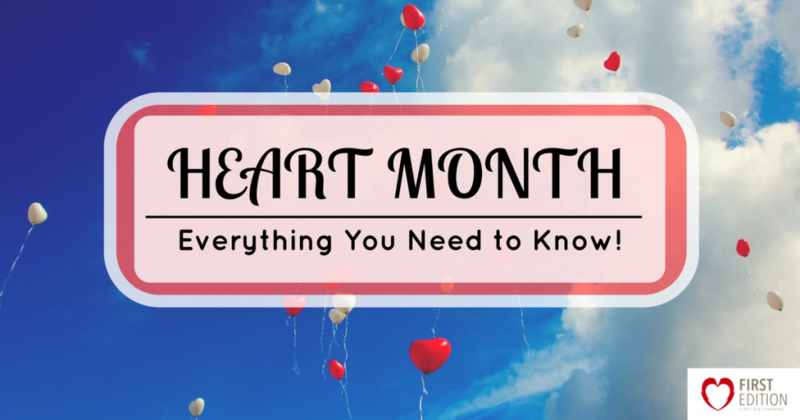 Heart Month - Everything You Need to Know! - First Edition First Aid Training Inc.
Home / Blog / Heart Month – Everything You Need to Know! If you have been present on social media in the past few days, you have probably noticed people discussing Hearth Month. Most assume that “heart month” is for Valentine’s day, but since when did it become a whole month? Heart Month is actually a month-long event dedicated to the heart (the “lub-dub” heart, not the Valentine’s shape)! Unfortunately, many people are not aware that this is in effect and go about their daily business not knowing any better. The fact is, that everyone should know what heart month is about because it is a month filled with support, fundraising, awareness and … yes, even a little love! Here is all you need to know about Heart Month and knowing how to keep your heart in tip-top shape! Heart Month takes place in the month of February and is focused around heart health. Most of North America takes part in this monthly occasion by hosting various events and speaking up for those with heart disease. All across the country people discuss how they can raise awareness for heart disease, assist those who have heart disease, or discuss preventative measures. Heart healthy recipes are shared, articles discuss various heart research, and events and fundraisers are held to support those with heart disease. Heart Disease – What is it? Unlike other disorders, heart disease can happen to anyone. It is a disease that affects the functionality of the heart and can be affected by our lifestyles and what we put into our bodies. Heart disease is not one overlying condition but it is actually categorized into different conditions. There is angina, arrhythmia, atrial fibrillation, and the more commonly known heart attack, heart failure, and cardiac arrest. Heart disease may affect the rhythm of your heart, how it is pumping blood, the heart’s muscles and blockages in your blood vessels. All types of heart disease are very serious, and it is a condition that should not be taken lightly. This is why it is important to be informed of heart disease and know what the risks and preventative causes are! Unlike some health problems, heart disease is preventable and can be managed throughout your lifetime. There are various risk factors that can be identified and improved upon to decrease your chance of heart disease. Some of these risk factors include smoking, lack of exercise, unhealthy diets, over-consumption of alcohol, high stress, being overweight, and having too high of blood pressure. Luckily, all of these risks are manageable and so long as you do your best to live a healthy lifestyle and avoid these risks, you are on your way to a healthier heart! It is important to see your doctor for annual or biannual check-ups so they can assess and be informed of your heart health and have you working towards a healthier you! If you are interested in Heart Month, get involved and spread awareness of heart disease. Donations are accepted through various organizations that go straight towards heart research and those with heart disease. There are also various opportunities for you to volunteer! The Heart and Stroke Foundation has many volunteer openings and you can even find opportunities within your own community. A simple google search will show you all the opportunities across North America! Make others aware of heart disease. Learn tips and tricks for maintaining a healthier heart by looking for Heart Month events and information online. Social media is filled with great information on the heart as people share their stories, events, celebrations, and donation causes to encourage everyone to have a healthy heart! Work hard to keep your heart healthy and it will thank you over the long years you have yet to live! Want to learn more about heart disease and preventative measures? Head over to www.heartandstroke.ca to find out more information about your heart! Looking for opportunities to improve your first aid skill so you can step into action if heart failure should ever occur? Check out our first aid and CPR classes at https://firsteditionfirstaid.ca/first-aid-training/ !